Had you lived during the three centuries stretching from New York’s colonial days to the time of World War II, you would only have one option. 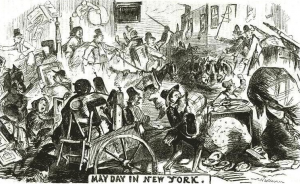 As the legend goes, Dutch settlers established this odd tradition in celebration of May 1st, 1626, the day they first set out to colonize Manhattan (later buying it from the Lenape on May 4th for a measly $23). Each year thereafter, the settlers would memorialize the trip by moving houses, and the tradition stuck. 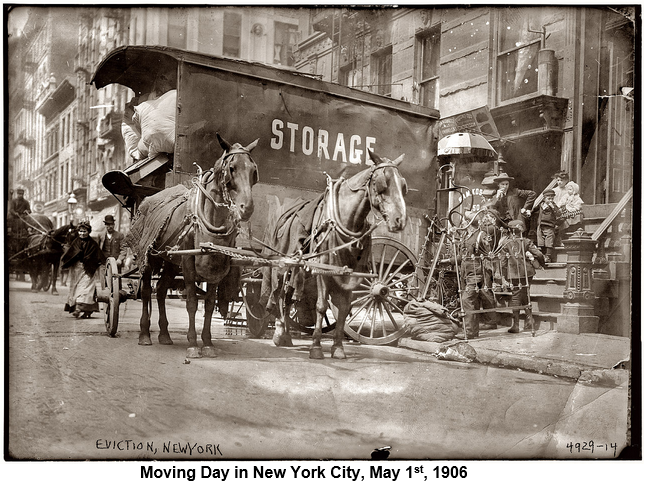 There may no longer be a Moving Day, but many aspects of moving in New York City still do vary from season to season. Here are four seasonal trends you should be familiar with when deciding when to move. The chart above, from Google Trends, shows how the volume of apartment searches online varies during the year. The low points are in December, ostensibly because of the holidays. The high points are consistently in July or August, due in part to the flood of college grads that move to the City after graduation. A similar seasonal trend emerges when you look at the amount of time apartments stay on the market before being rented. 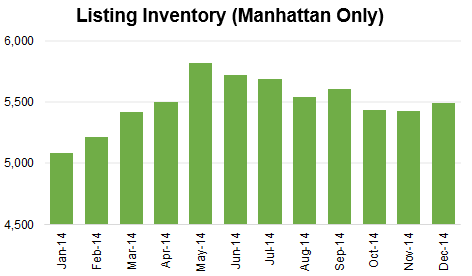 As shown in this chart, apartments get snapped up faster during the summer. All else being equal, more time on market is of course better. Not only does it mean less pressure to close right away, but it can also afford you more flexibility with your move-in date, as well as more bargaining power when negotiating the terms of the lease. As this chart illustrates, there are more apartments available in summer than in winter. Summer is the most common time for leases to begin and expire, leading to a larger inventory and more options to choose from. With the availability of apartments in NYC being very limited to begin with, this is a clearly an important issue to consider, especially if the apartment you are looking for is one with particular or uncommon qualities. The truth is that most people are just looking for a decent place they can afford, making price the most important factor. 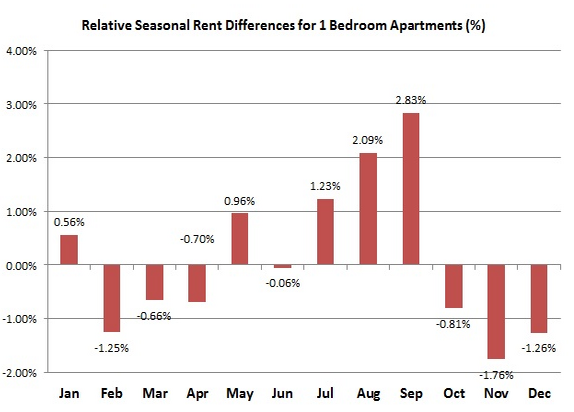 This chart, created by Renthop, illustrates how the price of a typical 1 bedroom rental unit varies during the year. The price swing between the high and the low points is about 4%. So, for a $4,000-per-month unit, renting in winter could save you as much a $160 per month versus renting the same apartment in summer. $160 per month may seem like splitting hairs, since it would represent only slightly more than a one day’s worth of rent. But over the course of a one-year lease, the total would amount to a savings of $1,920. 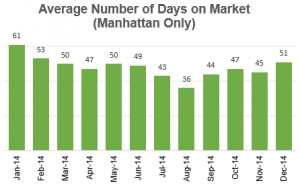 So, when is the best time to rent an apartment in New York City? 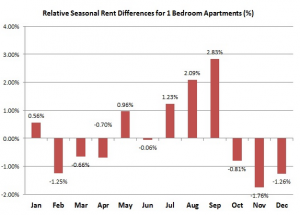 For most people, renting in winter is probably the better option. You are likely to get better value for your money and more flexibility with move in date. You also have less chance of ending up in a situation where you feel pressured to make a rushed decision. On the other hand, if you you plan to live in the apartment for a while, having a bigger selection from which to choose may outweigh everything else, making summer the better time to move. In either case, when you start feeling frustrated with your apartment search, just remember, most people who have ever moved to New York had to do it in competition with everyone else in the City. Revaluate is a free home history report that helps buyers and renters know what it would really be like to live at a specific address, before moving there. I really appreciate all of the information you’ve shared. the apartment reviews are indeed beneficial to those who are looking for an apartment to own or to rent. Very interesting article, thank you! Browsing websites that have a really great offer helps me a lot when I was trying to find a new apartment here. Great read! I found it extremely helpful! Thanks for helping me understand that renting in the winter is going to save me $160 per month which can amount to $1,920 a year. With that in mind, I will definitely look for an apartment after the autumn season to save up in the long run. I just needed to move out of my parent’s house and live in the city since the traffic is unbearable which caused me to get a memo. This will help me find one that fits my budget. Previous story Are These 6 New York Pied-a-Terres Nefarious?